Duke Corporate Education>Insights>Finance>What’s next for retail banking in the automated age? What’s next for retail banking in the automated age? A human’s role in the retail banking industry of the future. A set of glass doors zip open onto a quiet lobby lined with counters, desks and squat, square offices. Once you enter, you go up to a customer service ambassador for instructions. “Good to see you again,” they say with a smile. They remember you from your last visit – and every visit you’ve made since you first joined the bank. As you show them your bank card, you explain the reason for this trip. Smiling, the ambassador politely guides you towards a security door. Striding straight through the barrier, you emerge to a second, smaller room, with agents waiting to deposit your money. Once you select an empty booth, the whole transaction takes less than two minutes, and you’re back on the street. And you haven’t interacted with a single human being in all that time. 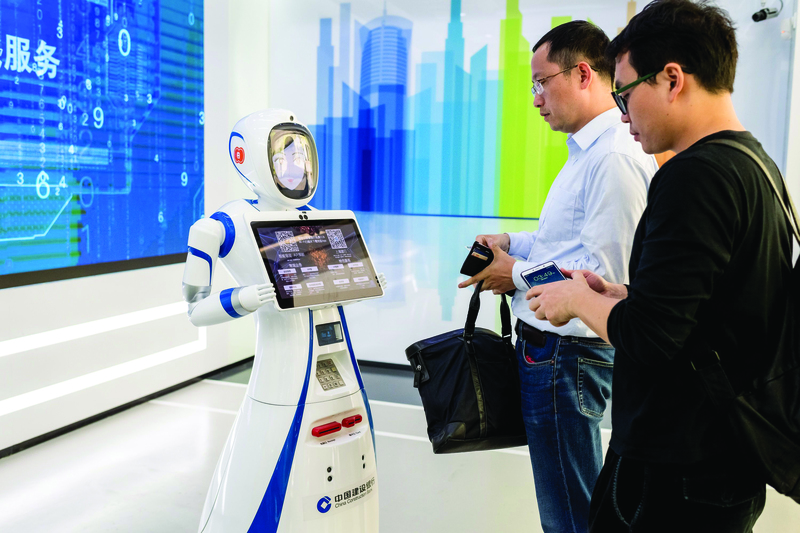 The world’s first robot-run bank branch, the Shanghai outpost of China Construction Bank (CCB), prides itself on efficient, amiable service – all without the need for flesh-and-blood staff. Stuffed with the latest in facial recognition, virtual reality, machine learning and financial technology, CCB’s robotic branch ‘employees’ dramatically cut labour costs whilst significantly speeding up the in-person banking process. Led by branch ambassador bot, Little Dragon, this crack-team is the focal point of CCB’s strategy to future-proof the bank branch model. In a world where 52% of all consumer banking transactions now take place digitally, and bank branches are closing at a breathtaking rate, saving the traditional branch model is no small task. If you store your money in a traditional bank (or possess a Visa credit card), it is highly likely you have at some point found yourself on foreign soil with no access to cash or credit. When you were unfortunate enough to discover your bank had no branches in that strange land, you faced exorbitant phone bills, SOS calls to far-off customer service reps, furious, jetlagged, sunburnt, even diarrheic, attempts to explain the issue – and several stressful cash-strapped hours. And whether you’re away on business, vacationing, working abroad, living in an isolated area or simply unable to reach a branch during office hours, digital banking can be a whole lot more convenient. Digital-only banks aren’t just good for current-account management, either. According to the Way We Bank Now survey, conducted by EY for UK Finance, customers are increasingly using apps to access services such as savings, credit cards and mortgage and investments accounts. Whatever the spark, the fire has spread: today, digital banking is so popular that the UK saw a sky-smashing 350% increase in usage over the last six years. And for apps in particular, in 2016 that meant 159 banking app logins occurring every second. Why, then, do 34% of consumer transactions still take place in bank branches? And this lack of feeling, says relationship-centric bank, Metro Bank, is why human-staffed bank branches will always succeed. And though a far cry from Metro Bank’s seven-day and late-night coffeehouse environment, the robot-run CCB branch, too, acknowledges this emotional connection, offering – for more complex transactions – in-branch conversations with human relationship managers via video chat. But with rocketing rent and labour costs forcing record branch closures across the globe, it seems customers – and financial service providers – will soon face a choice: learn to trust fintech, return to traditional relationship banking, or seek a happy medium.